Looking northwest, 1963. Orange St. is on the left, N. Mangum on the right. The First Baptist Church was the first church in Durham. The congregation formed in 1845 as the Rose of Sharon Baptist church, according to Boyd's history of Durham, "in the Piney Grove schoolhouse, 1 mile south of West Durham." In 1850, with population growing near "Durhamville" and Prattsburg, they moved their congregation to the current Pettigrew St. With the railroad contruction, they moved to the area of the 500 block of Cleveland St. Boyd describes it as a "country church" on 4 acres, with "preaching held once a month" as there was no regular pastor. 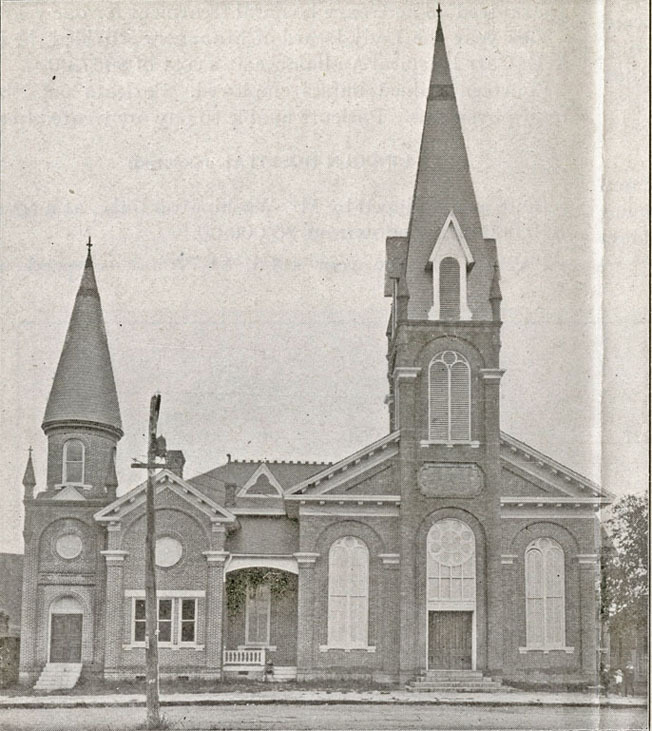 In 1876, Dr. Columbus Durham wsa employed as a full-time pastor, and the name of the church was changed to Durham Baptist, as another congregation to the north of Durham had also taken the name Rose of Sharon. 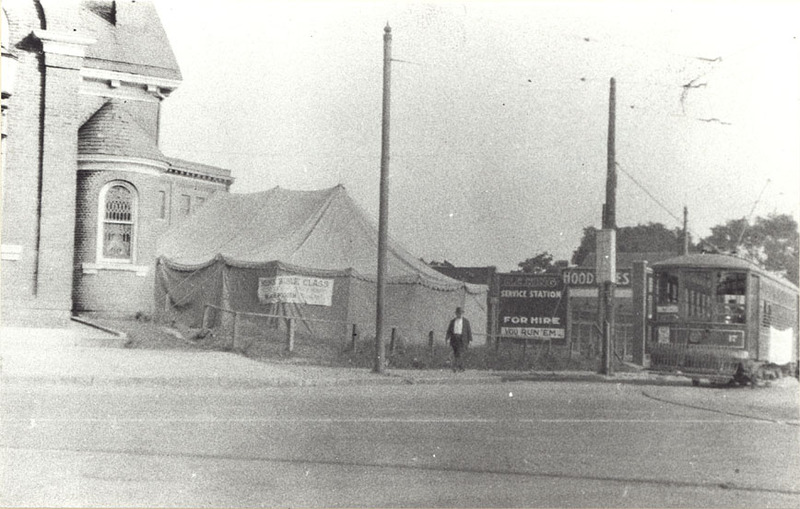 In 1878, the church wanted to move to the center of town, and purchased a lot on Mangum St. They constructed the above church soon thereafter. 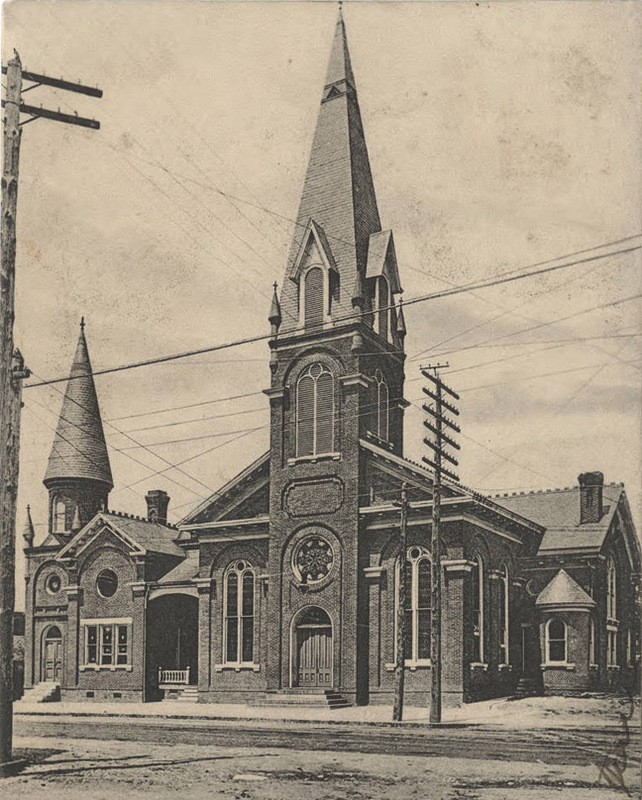 (Courtesy Durham County Library) With the establishment of Blackwell's Baptist Church on West Chapel Hill St. in the 1880s, the name of the church was changed to the First Baptist Church. 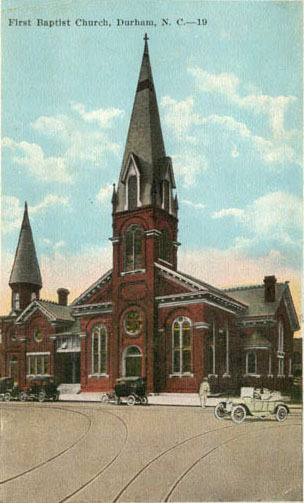 The small steeple on the south side of the church was an addition to the original structure added in about 1890. The town grew around the church, and by the turn of the century commercial structures had nearly surrounded the church. This picture, looking west, shows the trolley lines coming from Holloway St. and diverging north on Mangum and south to join Main. First Baptist from N. Mangum St.
One of SE Rochelle's motorcycle tours, starting across the street from his bicycle and motorcycle store in front of FBC. Below, looking northwest, the church in 1924. The 100 block of East Parrish St. is in the foreground. The road just to the right of the church was Rigsbee Ave., which used to extend past East Chapel Hill St. to North Mangum. The piece of land between Orange, Mangum, and Rigsbee St. was then developed with commercial structures as well. At the southern 'point' of this semi-triangle was Boone's Drugs. 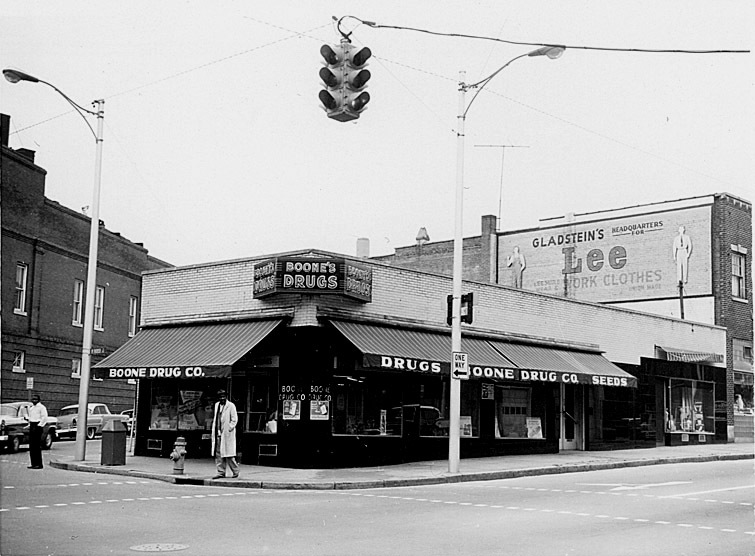 DL Boone had joined with the Haywood-King drugstore, and King sold his interest to Boone. The new drugstore, Haywood-Boone, was located at the northwest corner of W. Main and N. Mangum Sts. until that location was sold to Walgreen's in 1937. Haywood left the business, and DL Boone opened his own drugstore at the Orange, Rigsbee, Mangum location. By sometime in the mid-1960s, Boone's had closed and the building had become "The Coffee Break". Looking northeast - Orange St. is on the left. Just north of Boone's Drugs on N. Mangum St. were several commercial structures and businesses, including Gladstein's, which "fit the big man." Looking northwest from N. Mangum., 1963. Boone's Drugs is at the left edge of the picture. These structures angled a bit at the less-than-90 degree intersection with Rigsbee Ave.
By 1973, the parking deck on East Chapel Hill had been constructed, blocking off Rigsbee Ave., and Boone's Drugs / The Coffee Break had been demolished. These remaining buildings were demolished soon after this, and the whole area became surface parking. Looking northwest at the former interection of Rigsbee and N. Mangum. Looking north at the former 'point' of the triangle/ Boone's Drugs.